He should have won the Nobel prize for literature - and might have had he lived longer - but as it is, Mahmoud Darwish inspired a generation of readers and poets in the Middle East, and beyond - becoming one of the most admired, loved, outspoken, and sometimes controversial, poets of the age. As editor, with Val Stevenson, of 100 Poets Against The War, I worked with many global poets. We were thrilled to have his poetry as part of our project - it added so much. The great man will be missed. Great to hear Darwish's poetry in the original language on the BBC website. Thanks for the link. Poetry has lost a very big heart. For me Darwish is a symbol not only of the Palestinian struggle, but of the very possibility of peaceful coexistence, in whichever part of the world we may happen to look towards. 10 minutes are sufficient to live by chance. 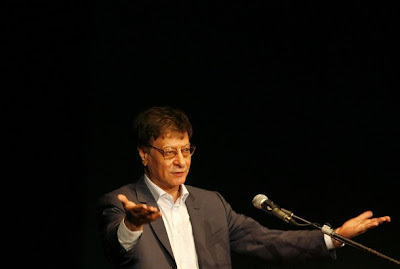 Here's a homage to Darwish in the Maltese language: Mahmoud Darwish 1942-2008.